The Provisional Report is the only inquiry / investigation report that is prepared by the inquirer / investigator. Exceptions to this are if legal advice is required, or if the inquirer / investigator prepares a report seeking advice from a senior officer. The Provisional Report is submitted with a simple Provisional Report Cover Sheet which assists Professional Standards administration. The Provisional Report from the inquirer / investigator contains their recommendations as to provisional findings, provisional determinations and provisional actions. Only the delegated authoriser can authorise them and may amend them. A sample of the Provisional Report is at Appendix D. Word templates for the Provisional Report and Provisional Report Cover Sheet are available on the intranet. The Provisional Report must be proportionate to the allegations. Brevity is required. The Provisional Report is to include the sections listed below, which are also clearly set out in the template. It is the role of the inquirer / investigator to provide the authoriser with provisional finding(s), provisional determination(s) and provisional action(s) in the Provisional Report. The outcome of the inquiry / investigation contained in the Provisional Report must adhere to the principles of procedural fairness and provisional Code of Conduct findings must be made on the balance of probabilities. A template of the Provisional Report is available and it is the only inquiry / investigation report required. A simple Provisional Report Cover Sheet is also required for administrative use in Professional Standards. If there is sufficient evidence for a member to be charged with an offence or crime, a standard court file is to be completed. A Provisional Report might be required at this stage – or may be deferred pending the outcome of the court process. This is to be determined by the Deputy Commissioner. In general terms the inquirer / investigator’s responsibilities cease at this point, unless the file is returned to them. No two Abacus investigations are the same and no two subject officers have the same service history and conduct history; therefore a one-size-fits-all outcome would be unfair and inappropriate. Section 43(3) Actions should be considered if a member has been provisionally found to have breached the Code of Conduct. 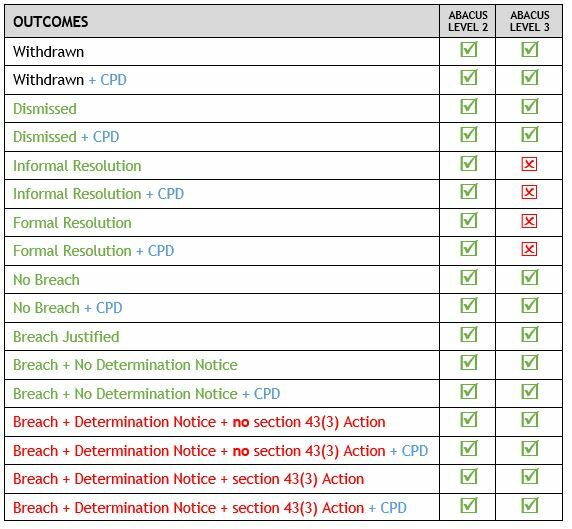 CPD opportunities are to be considered in all Abacus matters, whether or not there is a provisional determination that the Code of Conduct has been breached. CPD should occur in the interests of continuous improvement and development of the knowledge and skills of members. Any action taken under section 43(3) of the Police Service Act 2003 is discretionary. Action is taken to maintain, restore and enhance public confidence, to uphold proper standards of conduct and to ensure members are accountable for their actions. In considering the final outcome of a matter inquirers / investigators must give due credit where a member has made a voluntary disclosure or an apology to a complainant. must ensure that public confidence in Tasmania Police is maintained, enhanced and, where necessary, restored. For further information refer to Provisional Action. Inquirers, investigators and authorisers are required to contact Professional Standards to receive advice about the appropriateness of intended actions. This will assist in achieving equitable outcomes across Tasmania Police. The separate roles of inquirer / investigator and authoriser in the process, combined with audits by Professional Standards, ensures accountable and fair decision-making. Professional Standards provides six-monthly reports to the Deputy Commissioner including a section on the equity of outcomes across the State. This section describes the structure of a Provisional Report. An example Provisional Report is at Appendix C.
This section describes the purpose of the report, advises who the inquirer / investigator was and that the Provisional Report is based on the inquirer / investigator’s recommendations. It also provides, in broad terms, the provisional outcome. Note: whilst the Provisional Report is based on the recommendations of the inquirer / investigator, the authoriser exercises their own judgement in relation to the matter and must be satisfied that the provisional findings are able to be substantiated on the balance of probabilities. Clear statements are required on conflicts of interest. The authoriser is to state whether or not an actual, perceived or potential conflict of interest exists or could be seen to exist that renders them, or might be perceived to render them, unable to impartially assess the matter and complete their responsibilities. The inquirer / investigator is also to state whether or not an actual, perceived or potential conflict of interest exists or could be seen to exist that renders them, or might be perceived to render them, unable to impartially assess the matter and complete their responsibilities. Further information on conflicts of interest is available at Part 1.47 of the TPM. If the subject officer elects this course of action, the written submission is to be forwarded directly to the authoriser. The subject officer may provide a copy to her/his manager should they wish to do so. The authoriser will consider any submission the subject officer makes in response to this Provisional Report. The authoriser will then, within 15 calendar days of receipt of the submission (or other period of time which will be specified), issue a Final Report and, if applicable, a Final Determination Notice. The Final Report and, if applicable, Final Determination Notice will take into account any matters raised by the subject officer’s submission. If the subject officer elects this course of action, a signed copy of the Provisional Report is to be forwarded directly to the authoriser. The subject officer may provide a copy to her/his manager should the subject officer wish to do so. The authoriser will then, within 15 calendar days of receipt of the signed copy (or other period of time which the authoriser will specify), issue a Final Report and, if applicable, a Final Determination Notice. If the subject officer elects this course of action, a signed copy of the Provisional Report is to be forwarded directly to the authoriser. The subject officer may provide a copy to her/his manager should they wish to do so. The Provisional Report then becomes the Final Report and any Provisional Determination Notice will become the Final Determination Notice. Once any actions required on the Final Determination Notice are completed the matter will be considered finalised. 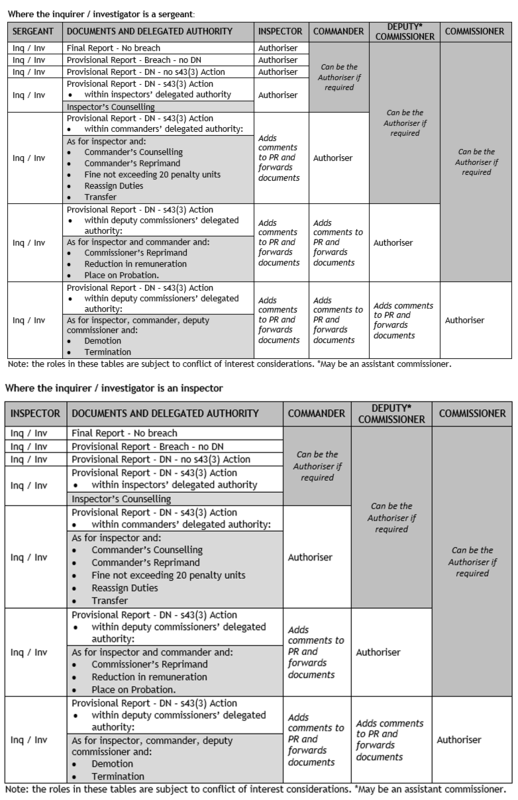 The Provisional Report stipulates that the 15 calendar day’s response provision applies unless the subject officer is granted an extension by the authoriser. It also stipulates that if the subject officer does not respond to the Provisional Report within 15 calendar days (or other period as agreed) the matter may be finalised in the terms of the Provisional Report. The subject officer is advised in this section of the report that they are being directed to submit a response under the provisions of Section 35 (2) (c) of the Police Service Act 2003. In the interests of fairness, they are further advised that if they do not respond it may be considered to be a failure to comply with a lawful direction, contrary to Section 42(3)(b) of the Police Service Act 2003. The subject officer is informed that they can contact the authoriser directly, or through their manager, if there is anything that they would like clarified, if they require an extension of time, or if they would like any further advice. The subject officer’s rights are listed in this section of the Provisional Report, together with contact details for the Police Association of Tasmania and People Support. A very brief overview of the incident is to be provided here. The overview provided should be proportionate to the level of the matter (2 or 3). A concise summary of the alleged behaviours is required. If there are multiple behaviours (or incidents) they should be separately numbered and ordered chronologically where possible. At this point there is no need to link them to any particular Code of Conduct matter (for example ‘bring discredit’ would be listed by the specific behaviour such as sending an abusive e-mail from a Tasmania Police e-mail account). A concise summary of the inquiry / investigation undertaken is to be required. This should include the names of people interviewed, and any witnesses who were not interviewed. The evidence in relation to each behaviour should be briefly described. Any points in issue or disputed facts should be identified. A provisional finding about the alleged behaviour and whether or not it occurred, on the balance of probabilities is to be recorded for each alleged behaviour. Sample wording is “…my provisional finding, on the balance of probabilities, is that behaviour #1 occurred/did not occur…”. It is provisional because it is subject to change by the authoriser, or following a written submission from the subject officer (should they choose to make one). Having arrived at a provisional finding that a certain behaviour did occur, a provisional determination then needs to be made to identify whether or not that behaviour amounts to a breach of the Code of Conduct. Having provisionally found that behaviour #1 occurred I considered if the behaviour amounted to a breach of section 42 (Code of Conduct) of the Police Service Act 2003.
ensure that public confidence in Tasmania Police is maintained, enhanced and, where necessary, restored. A clear statement is required that details any mitigating factor(s). If there is no mitigating factor this needs to be stated also. The subject officer’s engagement in the process and openness and honesty is to be commented upon in this section. The subject officer’s service history is to be stated. As a minimum it is to include their date of appointment, rank, and current position. It may be appropriate to also add secondary roles or other known significant matters (e.g. previously awarded a Commissioners Commendation for bravery). the date the subject officer signed the Determination Notice (if more than five years old the Determination Notice is to be given reduced weight in determining an appropriate provisional action). A statement is required about how the behaviour does not reflect the Values of Tasmania Police. It is essential that you understand that integrity, equity and accountability must guide our actions and that our behaviour must be appropriate and disciplined. Tasmania Police values are the foundation for the types of ethical behaviour expected from members. This behaviour must be demonstrated in all aspects of work. Your behaviour has fallen short of the standard that we, and the community, expect. You have however, through this process, conducted yourself appropriately. You have demonstrated that you are prepared to be accountable for your actions and have been open and transparent. The provisional action recommended should clearly specify which behaviour(s) it is linked to – if it applies to all behaviours then the words “Provisional Action (Global)” should be used. If it is linked to a section 43(3) action, the precise action should be detailed, e.g. “section 43(3)(a) Inspector’s Counselling”. The action is provisional because it is subject to change by the authoriser, or following a written submission from the subject officer (should they choose to make one). A clear statement must be made in relation to whether or not the matter will have any impact on the subject officer’s eligibility to wear, or be considered for, medals. There is to be no impact unless a provisional action of reprimand or higher is proposed. If a reprimand or higher is proposed the authoriser must clearly state the length of time that the member will not be entitled to wear or be eligible for medals. Any CPD is to be described including detail of who is to administer it (e.g. the subject officer’s supervisor or manager) and whether it involves another area such as the Operational Skills Unit. The time frame in which it is to be completed also needs to be stated. Provisional Determination Notices are to be prepared by the inquirer / investigator and will be amended, if required, by the authoriser. A provisional Determination Notice must include any section 43(3) Action or CPD opportunity. Provisional Determination Notices may have either one of those outcomes, or both, or none. A template is provided and is available here, all fields (up to and including the authoriser’s signature) are mandatory. An example Determination Notice is provided at Appendix D.
The wording of provisional Determination Notices must state which section(s) of the Code of Conduct has been breached for each complaint allegation, internally raised matter or compliance review matter. In addition, the notice must specify the extent to which the member’s conduct is inconsistent with one or more of the Tasmania Police Values, the Police Officer Oath / Affirmation or the National Police Code of Ethics. “In addition to the action/s under section 43(3) of the Police Service Act 2003, you are to be provided with Continuing Professional Development of [description of the professional development e.g. verbal advice and guidance by a supervisor / manager] in respect to the above-mentioned breach(es) of the Act”. “Whilst a breach of section [ ] of the Police Service Act 2003 was determined, it is not necessary to enact any of the actions provided by section 43(3) of the Act. You are, however, to be provided with [description of the Continuing Professional Development e.g. verbal advice and guidance by a supervisor / manager] in respect to the above-mentioned breach(es) of the Act”. ensuring all documents are printed in hard copy, and recording on the documents the date they were uploaded to BlueTeam; then forwarding the hard copy file to the authoriser. This page -- https://www.police.tas.gov.au/about-us/abacus/11-provisional-report-by-inquirer-investigator/ -- was last published on March 1, 2018 by the Department of Police, Fire and Emergency Management.